Categorizing listed words, through grouping and labeling, helps students organize new concepts in relation to previously learned concepts." (Reading Rockets, 2015). "List-group-label is a form of semantic mapping. The strategy encourages students to improve their vocabulary and categorization skills and learn to organize concepts." (Reading Rockets, 2015). The first step, list, is when the class brainstorms ideas that deal with a large topic. The next step is group. During grouping, students take their listed ideas and group them into certain categories. After students have come up with all of their categories, they label the groups into categories. When students make connections between the topics they are reading, they will comprehend the text better and be able to understand their vocabulary more. "Clearly there is a large vocabulary gap between ELLs and their English proficient peers." (Wright, 2015). 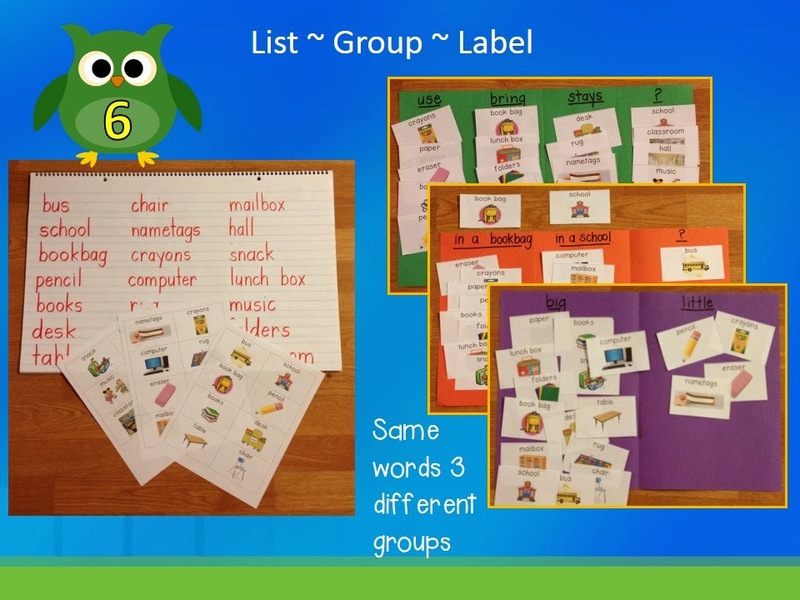 By using a list-group-label with whole group or small groups of varying abilities, it will help ELL students to understand and connect to the vocabulary words better. "According to Vygotsky, learning is a social activity, and knowledge is constructed through interaction and collaboration with others." (Wright, 2015). "It helps students organize their understanding of specific vocabulary and concepts. It builds on students' prior knowledge about a topic. It actively engages students in learning new vocabulary and content by activating their critical thinking skills. It teaches categorizing and labeling skills." (Reading Rockets, 2015). This is an excellent video that demonstrates the list-group-label strategy. Watch as she assists students in their zone of proximal development. She involves the students throughout the entire process and asks for their opinions. This teacher is modeling a very effective comprehension strategy. "Select a main concept in a reading selection. List: Have students brainstorm all the words they think relate to the topic. At this point do not critique student responses. Some words may not reflect the main concept, but hopefully students will realize this as they begin grouping the words in the next step. Group: Divide your class into small groups. Each group will work to cluster the class list of words into subcategories. As groups of words emerge, challenge your students to explain their reasoning for placing words together or discarding them. Label: Invite students to suggest a title or label for the groups of words they have formed. These labels should relate to their reasoning for the grouping." (Reading Rockets, 2015). Watch as this teacher provides support during a list-group-label with a small group. It is important to know that you can use a list-group-label in small group, whole group, or individually. These students and the teacher discuss the connections they made between all of the words and categories. "Ask students to return to lists it as they read through and the text related to the major concept they brainstormed about. They may find they should add words from their reading or re-label the groups of words they created. Encourage students to discuss lists with others outside their initial small group. Have students write the lists or type them using a word processing program. Provide students with pre-established categories to use to group words. Create graphical representations of words in order to help students connect to prior knowledge. Ask students to create their own drawings to accompany the words." (Reading Rockets, 2015). English Language Learners will benefit from a list-group-label lesson because they will be activating their prior knowledge and learning how certain topics connect. This will give these students a chance to brainstorm their ideas, group their ideas with similarities, and then go through and then label them with the connections that they made. "Students need to connect familiar words with new words, expanding their conceptual understanding of vocabulary. Then, during and after reading, they revisit their categories to expand and make changes." (Miller, Veatch, 2011). "Teachers can help ELLs acquire new words in instructional and natural, noninstructional ways, by understanding that vocabulary acquisition happens most easily in context and related to topics that the students care about." (Wright, 2015). "By revisiting during and after reading, the teacher can ensure that students are learning the word meaning that is connected to the area of study." (Miller, Veatch, 2011). Reading: While reading a story, students and the teacher can come up with a common theme (ex: Arctic animals). The teacher is going to write the theme on the whiteboard and the students are going to brainstorm ideas (ex: polar bear, arctic hare, penguin, seals). Once these are listed, the students are going to come up with categories to fit all of their ideas into (ex: animals with fur, animals that live in the water). Once all of the ideas are placed into categories, the students will label the categories. This entire process will help students prepare for what they are about to read about. It is activating their prior knowledge, as well as making them create connections between their ideas. This is a great activity to use before or after reading a story. If used before, it will help students prepare. If used after, it will help students reflect on their readings as well as make a deeper connection to the text. Science: While working with a new science topic, it is common practice to ask students what they know about the topic before jumping into it. This way, you can clear up any misconceptions and help them start thinking about the content before the lesson. Using a list-group-label could be the start to a great open-ended discussion about whatever science topic is next. This would be a great informal assessment for teachers to see how much students actually know about a topic before teaching it. Math: Math list-group-labels are about the same as a science list-group-label. Teachers want to use this before going through a new lesson to clear up any misconceptions and hear what students already know about a topic. If listing becomes to difficult for students, the teacher can have the listing already done for the students. Then, it will be up to the students to label and group them. This is a way to adapt your instruction to meet the needs of your students. Social Studies: When discussing cultures or geography, a list-group-label lesson will help students connect to the material. They can list different attractions, movement, regions, human/environment, places, and location. Once they have their list of things, they can group them into whatever categories they want. There will be various ways that students can group the items listed. Once their groups are done, they will be able to categorize them. Example lesson from the SIOP book: "After a whole-class brainstorming and List-Group-Label activity about why people leave their homes and move to new locations. Mrs. Chen does a quick-write on the Gold Rush. She then provided a "jump-start" for the English learners with very limited proficiency by introducing key vocabulary, passing around iron pyrite ("fool's gold"), looking together at a map of the trails west, and viewing several pictures of pioneers and Gold Rush characters." (Echevarria, Vogt, Short, 2014). Echevarría, J., Vogt, M., & Short, D. (2014). Making content comprehensible for elementary English learners: The SIOP model (2nd ed.). Boston, Massachusetts: Allyn & Bacon. ReadingRockets. (2015). List-Group-Label. [Teacher writing on board]. Retrieved from http://www.readingrockets.org/strategies/list_group_label. ​Wright, W. E. (2010). Foundations for teaching English language learners: Research, theory, policy, and practice. Philadelphia: Caslon Pub.